The cover is made from asbestos. Of course, it’s been difficult for the Glasgow-based jazz sextet to get anything meaningful done lately on account of their unsettling obsession with lists. This release mainly focuses on the adjectives you could use to describe frontman Desmond Prince’s beard. The narrators tear-choked tones are reminiscent of their six-disc epic ‘Mwraaaaaaagkxr (oh. )’, an exhaustive recitation of all the reasons why pot-smoking freeloaders can pretty much sleep with whoever they want to. IT’S A BIT LIKE THAT BIT IN ULYSSES. SHUT UP JIMMY. Useless. It’s been six years since Glasgow was flattened by the event and I for one don’t think we as a species have it in us to name everything. Bass sax player and ‘activist’ Desmond Prince disagrees – “We are going to use these records to make a machine capable of recalling every mistake the human race has ever made”. I don’t think Desmond Prince should be allowed to get away with making such grandiose statements. The Cosmic Dead are clearly a dangerously insane group of individuals who I would like to see sectioned. I have not listened to this record. I am going to give it an I for Inexorable. 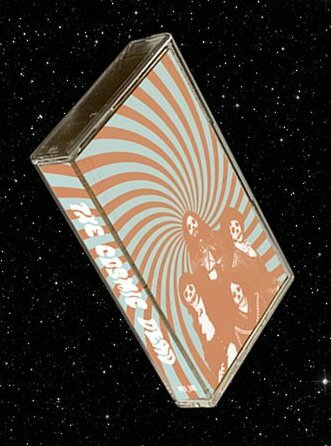 The Cosmic Dead will be playing a secret gig this Wednesday on the moon. Don’t go. You will not be able to breathe. This entry was posted in E.P / Single Reviews, Reviews and tagged Desmond Prince, Glasgow, S/T, Space, Stoner, The Cosmic Dead, The Event. Bookmark the permalink.